Students often get perplexed about how they should apply for MS in US or other countries because most of the time, they don’t have a clue about how to actually take the first step. From preparation to application, it is important for all MS aspirants to know where to start and where to finish. If they are unable to have clarity of thought about where to start and finish, they get confused. That’s the reason this guide is written, so that we can show you how you can start and where to begin. In this article we will not only talk about how, but will give you the blueprint for where to embark your application process. Only thing we will recommend is that you read the previous sections already written on MS so that you have somehow an idea about how this entire process goes. If not, you can read the whole article and go back to the earlier sections whenever you feel right. Sit back, relax and absorb the application process from beginning to end. A4Academics is committed to bring you the best value you can get anywhere on the net. If you have any queries related to MS, A4Academics will be the right place to start off. For the beginning process and when to start you application process, we have articulated a whole article which will help you decide when to begin. But if you have not gone through it yet, here it is again. The best time to start the application process is when you are on the last year of your graduation. If you have a year to prepare, you will be able to make decisions accordingly and you don’t need to rush or run for the application process. In this section, we will discuss a simple loop which will facilitate your understanding about how to apply for MS in US or in any other foreign universities. Just remember the loop and if you need to draw the loop in your notebook. It will be useful in remembering where to begin, what to do in between and where to finish off. The loop is simply a diagrammatic representation of the steps you need to take. After the diagram, we will discuss each step in detail so as to give you a through idea about how to prepare for each step. Now according to the figure, let’s look at each step in detail. This is the first step to begin with. Quite often the students make the mistakes of taking the GRE & TOEFL/IELTS tests after completing their graduation. This is a mistake because if you take the test after graduation, you are losing out a year or so. But if you decide early to go for MS, then 3rd or 4th year beginning of your graduation is the perfect time to take the test. If you are wondering whether you will be able to take the tests before completing your graduation, you needn’t worry. You can take the test during your 3rd or 4th year. 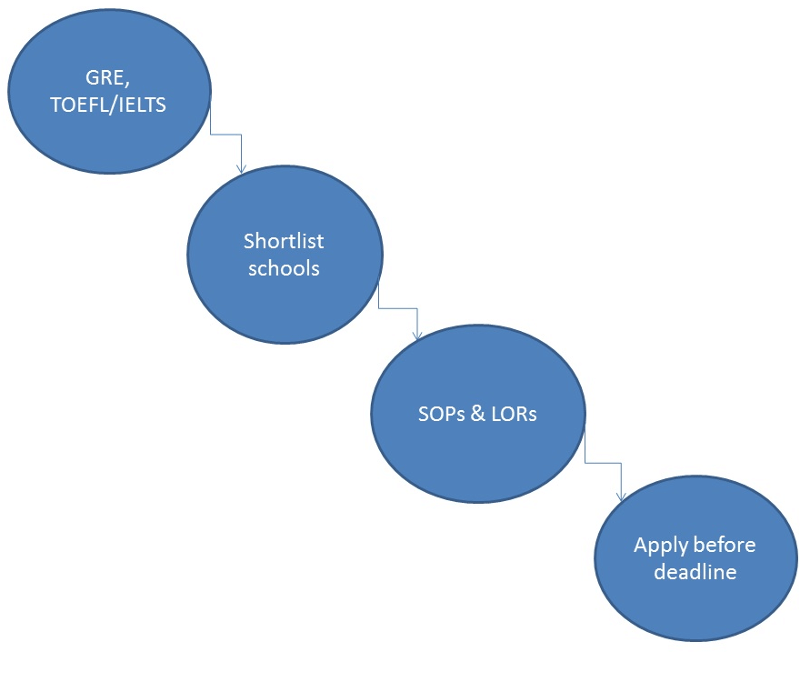 And even if you postpone further application process for few years, your GRE score would be valid for 5 more years. But there is a word of caution. For English Proficiency Tests, the score is only valid for 2 years. Thus, ponder, talk to your parents, do some soul-searching, discuss with your professors and then decide. You don’t need to get every bit of information at a go, but make sure that you know enough to make a concrete decision. And lastly, make your ‘why’ very clear. If someone asks you why you would like to do MS after your graduation, you should have the clarity to articulate your reasons under 100 words. This may seem toughest of all but if you go step by step it would become significantly easier. Here’s how. First of all, be absolutely sure of what you want. You may want to pursue your MS for varied reasons. No matter whatever your reason/s is, you need to streamline few things to make the process easier. The primary step is to choose a country where you would like to do your MS. It may be US, Australia, Britain or New Zealand. No matter whatever you choose, make sure you need to have strong reasons behind it. Don’t just go for it because your friends or significant others are going for MS in that country. Next, you need to see your budget. In later section we will discuss top 10 schools and will discuss about fees as well, but for now, be absolutely certain about how much you can spend on your own. Ask your parents, talk to the banks and take the suggestions of your professor and then streamline your choice of schools accordingly. Once you are done, then you need to choose few schools under the constraints you have. After shortlisting the universities, it is time to prepare Statement of Purpose (SOP) and Letter of Recommendation (LOR). Along with that you need to prepare your resume and facilitate to create official transcript. These documents are most important as they will ultimately decide on your candidature in the top-notch universities irrespective of your GRE score. Yes, GRE score matters, but not only the score, how you apply affects a lot too. Once the shortlisting is done, it is time to fill up the application form and apply online (best way). You also need to attach all your important documents including resume, transcript, SOPs and LORs along your application form. Always make sure before applying you have thoroughly checked the website of the universities, their faculty members, the alumni, the placements and everything that you need to know. Once the application is done, you will get notification from universities which will accept your candidature. When your candidature will be accepted, you need to apply for VISA. In later section, we will discuss thoroughly about VISA and how to go for it in detail. Another thing which needs to be mentioned is which semester you should choose. According to the experts, you should always apply for fall semester. 35% of the universities don’t admit students in spring semester. Thus, if you apply for fall, your chances of getting selected will drastically improve. Another reason to choose fall semester is in fall, most of the core subjects are being offered. In spring, it is not so. But you may ask if everyone would go for fall, whoever else will go for spring?! The chances in spring semester are limited. Don’t take our words, check it out by yourself. It will help you make better choices and increase your candidature in the top universities in foreign countries.